Brown rice is a whole grain. It is naturally gluten free and is a staple in my diet. Unlike white rice, brown rice has all of it’s goodness intact and thus contains a ton of nutrition otherwise lost in the refining process. Brown rice contains the highest amount of B vitamins out of all grains. Additionally, it contains iron, vitamin E, amino acids, and linoleic acid. Brown rice is high in fiber, extremely low in sodium, and is composed of 80% complex carbohydrates. Because brown rice is a whole food, it takes longer to digest than white rice, providing the body with a sustained energy. I make at least 4 cups (more if you are cooking for several peeps) of rice so I have plenty of rice for use during the week. Typically the first night I will eat the grains steamed, mixed with olive oil and nutritional yeast in addition to greens, tempeh, tofu beans etc. The following days, I can use any leftovers in soups or in stir-fries or bean loaves, it could also be re-steamed and/or re-heated. I soak my rice a day in advance, usually before I go to bed or 1st thing in the morning (at least 8 hours); I rinse, wash and drain as much rice as I would like to prepare and then cover the washed grains with fresh water and put that on the stove top or counter (covered to keep unwanted pests and dust out) over night, and cook the grains the following day or later that evening. I find the rice to be more flavorful but also more digestible when soaked. It also cooks about 10-12 minutes quicker than un-soaked rice. It is up to you whether you refresh the water or use the soaking liquid to cook the rice in. Phytic acid is a naturally occurring organic acid in the outer layer or bran. All grains contain phytic acid to some degree, but brown rice contains a relatively high level. When brown rice with untreated phytic acid enters the intestines, the phytic acid mixes with calcium, magnesium, copper, iron and zinc. The chemical reaction that takes place prohibits those minerals from being absorbed and utilized by the body. Some sources say that eating grains with untreated phytic acid will cause the body to lose bone mass and will eventually lead to overall mineral deficiency. However, soaking brown rice and other grains will eliminate the consequences of phytic acid by producing beneficial enzymes and raising the amount of nutrients present in brown rice. Others believe that un-soaked brown rice is healthier, as it stays in the digestive system longer than soaked grains, thus providing more energy. Look for quality brown rice that contains a small amount of green grains, I always purchase organic and store it in airtight glass jars in a dark cupboard. My go-to is short grain, however there are several varieties including sweet, long grain, basmati, jasmine etc. that will all vary in taste and tooth feel…I suggest finding your favorite! 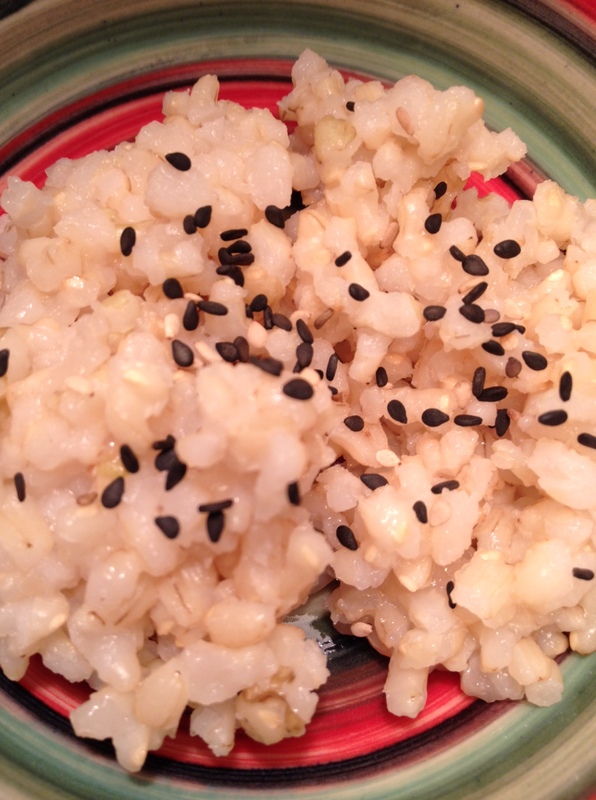 Short Grain Brown rice is a grain I always have in the house….ALWAYS…. Place all ingredients in a pot with a tight fitting lid. Bring to a boil, reduce the heat and let it cook uncovered for 5-7 minutes on a lower heat. I let about 2/3rds of the cooking liquid cook out uncovered and then when the water is barely visible in the pot, I lower the heat to it’s lowest setting and cover it. I find this helps from the sticky rice water from seeping out of the sides and making a mess, it also keep the rice from becoming water logged and soggy. *May also be prepared in a rice cooker with the same ratio of ingredients. This entry was posted in Gluten Free, Grains, sides and tagged animal free, antioxidants, comfort food, cooking at home, dairy free, fricken delicious, fricken yum, gluten free, local love, non dairy, save the planet, simple food, slow fast food, THE VEGAN LOVE PROJECT, VEGAN LOVE, whole food love, yoga fuel. Bookmark the permalink. ← Happy Gluten Free New Year with a Side of Yoga!